Saltwater Tropical Fish requires more attention and is harder to take care of. Most of these fish, which you can buy in aquarium stores are harvested and taken from their natural habitat and acclimatization in home aquarium tank can be a very difficult process. Here are some of the most common saltwater tropical fish, which you normally come across these days. Clown Fish is the most popular and highly sought after for its bright yellow and orange coloration. 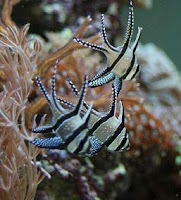 What attracted me to this saltwater tropical fish, is their cute feature and also their active behavior. This fish requires sea anemones for their survival and it can be quite tricky to keep the fish because the anemones have poisonous sting that can cause blister if not careful. Cardinal Fish is a hardy marine fish, which can be easy to maintain, and adapts well to new aquarium saltwater tank setup. They are known for their silver and black color combination that form stripes on their body. They usually grow up to average three inches in length and they are considered good community tank mates. Blenny is also another example of saltwater fish living in tropical waters. This unusual looking fish is easy to keep and they are good at getting rid of algae. Some of the common species that form this group of fish include lawnmower blennies, scooter blennies and eel blennies. 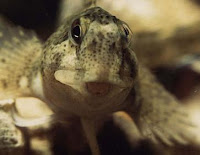 Other than algae, their diet includes mostly brine shrimps and other small invertebrates. Setting up and maintaining saltwater aquarium can be quite tough but with knowledge and experience, nothing is impossible. Discover more about fish keeping hobby with these tips and fish care guides.